A newly discovered fossil is filling a gap in the spotty record of a key evolutionary period  the phase when animals traded fins for feet and moved from their watery confines onto land. The 375-million-year-old fossil fish Tiktaalik roseae maintained much of its original shape and was near-complete when discovered in Nunavut Territory, Canada, missing only hind fins and a tail. Photo is by Ted Daeschler. 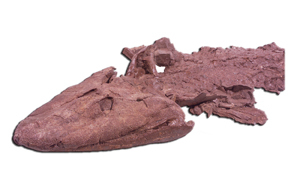 Tiktaalik roseae, as paleontologists named the find, has features similar to both fish and limbed relatives. On the older side of T. roseae is 385-million-year-old Panderichthys, the most complete fossil from the lobe-finned group, which has rounded fins and is considered an ancestor to land vertebrates. On the more recent side is 365-million-year-old Acanthostega, the most complete fossil of the earliest known four-legged animal, or tetrapod. Paleontologists have previously found fossils representing animals in between the two groups, but only bits and pieces, says Ted Daeschler, a paleontologist at the Academy of Natural Sciences in Philadelphia, Pa., which were not enough material to really make a lot of conclusions. The near-complete fossil of T. roseae changed that, and its features, described by Daeschler and colleagues in two April 6 Nature papers, reveal how lobe-finned fish transitioned into early limbed animals. In 2004, Daeschler and his colleagues uncovered the transitional 375-million-year-old T. roseae from sediments in the Fram Formation in Nunavut Territory, Canada. As a whole, T. roseae bears a closer resemblance to the older lobe-finned fishes. Like those older relatives, T. roseae fins had not yet become distinct limbs. Inside the fins, however, are strong, mobile skeletal structures that could have supported the animal. The T. roseae specimen retained fish-like scales, but just below the fishy scales, are flattened ribs that are an odd thing for a fish to have, Daeschler says. Flattened ribs, he says, are more familiar in animals that are not supported by water all the time. That characteristic suggests that T. roseae could have lived in shallow water or could have even crossed land. T. roseae was also missing the bones that commonly bridge the back of the skull and shoulders in fish-like relatives. The loss of that bridge could have facilitated locomotion and the catching of prey, again suggesting that T. roseae lived in shallow fresh water, the researchers say. The adaptation from water to land at about 375 million years ago makes sense, Daeschler says, considering that at that same time in Earths history when lobe-finned fish lived, plants were making the transition to land, beginning to diversify and establishing a new set of ecological niches. When theres an opportunity in nature, animals evolve to exploit that opportunity, Daeschler says. Understanding Earths history helped Daeschler and his colleagues find the fossils in the first place. The team knew the approximate age of the transition fossils they wanted to find, and read in an undergraduate textbook that rocks in the Canadian Arctic were about the right age. Norwegian explorers first entered the area 100 years ago by ship and reportedly found fossils, and more recently, the Geological Survey of Canada reported finding fish scraps in their notes, Daeschler says. But Daeschlers team was the first to go to the region with the distinct purpose of looking for fish fossils. The team pulled from one site the remnants of 10 different specimens of T. roseae that included mostly jaws, as well as three near-complete skeletons that almost retain their original shapes, aside from being slightly crushed. The team plans to return to the site this summer to try to find the still-missing hind fins and tail of T. roseae. As a subset of the expedition, the team will prospect in rocks 5 million years younger than where it found T. roseae, to look for specimens even closer to the transition time between fishes and tetrapods, hoping to further bridge the gap.